KIEV, Ukraine -- Ukraine’s parliament ratched up its cultural war against Russia yesterday (22 May) by backing television language quotas requiring major channels to broadcast at least three-quarters of their programmes in Ukrainian. 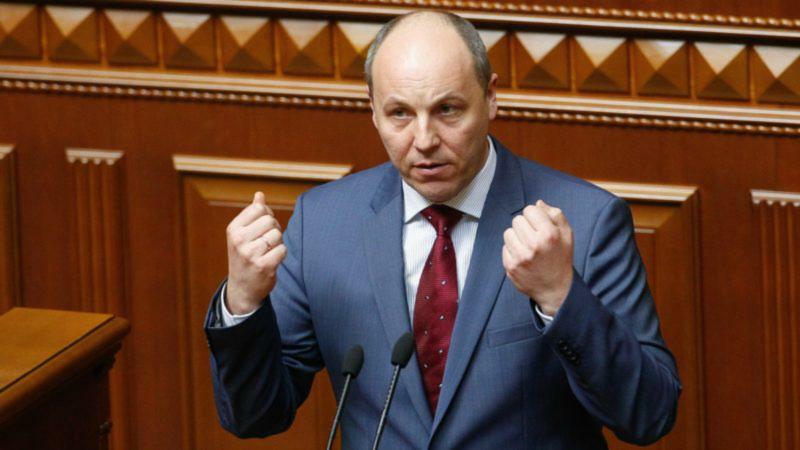 Andriy Parubiy speaking to lawmakers during a session of the Ukrainian Parliament in Kiev. The measure was passed a week after Ukraine blocked Russia’s most popular social media networks and a top internet search engine in a self-proclaimed effort to prevent Kremlin propaganda from reaching the crisis-torn former Soviet state. Ukraine’s Verkhovna Rada parliament passed the TV quotas bill by an overwhelming 269-15 margin. “Once again, the Verkhovna Rada has demonstrated that it is a Ukrainian Verkhovna Rada, one eliminating the remnants of the Soviet imperialist past,” parliament speaker Andriy Parubiy said after the vote. Most people in Ukraine speak both languages but Russian is used more often in the east while Ukrainian is preferred in the west. Ukraine came under intense criticism from free speech advocates and domestic users for prohibiting the Russian equivalent of Facebook and other popular internet services and sites. But nationalists and senior politicians saw it as a proper response to an information campaign that Russia is waging alongside the ground offensive it is backing in Ukraine’s separatist east. The three-year conflict has killed more than 10,000 people and turned Moscow and Kiev into sworn foes. Kiev has been gradually expanding its list of outlawed Russian goods and Russians barred from entering the country for either voicing support for the Kremlin’s March 2014 annexation of Crimea or the self-proclaimed independence of Ukraine’s separatist fiefdoms. Numerous Russian television series and movies have already been thrown off the airwaves and banned at cinemas. Ukraine has also blocked the import and sale of some books. Ukraine’s free speech and information policy committee chief Viktoriya Syumar said the bill she co-wrote was in complete agreement with existing European standards. “Such laws exist in a number of European countries,” she told lawmakers. “Totalitarianism only existed when Ukrainian was banned from use in our land,” she added in reference to the Soviet practice of forcing other republics to speak Russian. “This law will work for Ukraine, for Ukrainian culture and for Ukrainian performers, actors, directors and everyone who respects their country,” she said. The bill makes an allowance for local channels to only show half of their broadcasts in Ukrainian. President Petro Poroshenko is expected to sign the measure because his parliamentary faction backed the bill. The legislation is also expected to prompt an angry response from Russia. Moscow has long accused Ukraine of persecuting its Russian speakers.